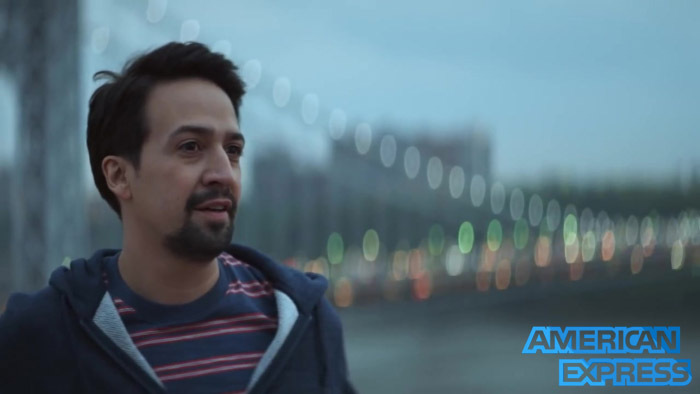 American Express teams with Lin-Manuel Miranda and it’s perfect! The buzz word in marketing these days is “authentic” and American Express and Lin-Manuel Miranda have just created the gold standard in a new advertising campaign. Miranda, the amazing creator of the pop culture phenomenon Hamilton, is showcased in television spots “doing life” in the New York neighborhood where he grew up and now lives, Washington Heights. Shot beautifully, Miranda is shown visiting actual businesses and notable locales of his life and career. He walks his actual dog, stops by Dichter Pharmacy where he picks up coffee on the way to the local barbershop, where he jokes around with friends (did anyone notice Christopher Jackson who played George Washington sitting in the barber chair?). There’s also a visit to Hunter College Elementary School on Manhattan’s Upper East Side, where he was actually a substitute teacher in 2002. And appropriately so, there’s a stop at the Richard Rogers Theater where Hamilton has enjoyed its smash Broadway run since 2015. Miranda was intricately involved in creating the ads – and it shows. The spots promote the concept that the financial services of American Express can be an important (and friendly) tool in supporting your endeavors and with Miranda’s personal touch, they are captivating and most importantly, believable. Bravo to everyone involved in the creation of these spots. It epitomizes the pitch-perfect use of a celebrity spokesperson.